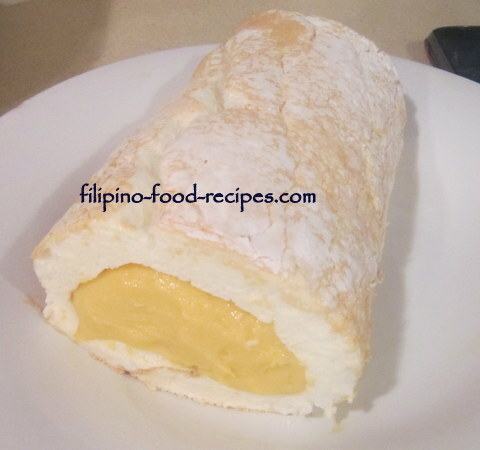 Brazo de Mercedes, a Filipino favorite dessert, is a meringue roll with custard cream in the center. It is quite easy to make, as long as you have a stand mixer, a half sheet baking pan and a reliable oven. First things first, though, the mixing bowl, whisk and spatula must be free of any oil, and the egg whites must not have any streak of the yolk. A drop of oil will cease the whites to expand and quadruple in volume. Also, a portable hand mixer will not do a good job. I use a KitchenAid 5 quart mixer, and the settings in the procedure are based on that particular mixer. You will, likewise, need a half sheet pan, and a parchment paper to easily unmold the meringue. 1 To make the meringue, beat the egg whites and cream of tartar at #4 setting of the Kitchen Aid mixer for 1 minute until frothy. 2 Add the sugar a little at a time and beat for another minute. You will be at a soft peak stage. 3 Raise the speed to #6 and beat for another 2 minutes, after which, raise to #8 and beat another 2 minutes. 4 Spread the meringue evenly on a 18" x 13" sheet pan, and bake for 20 - 25 minutes until slightly browned. 5 Set aside for 6 to 8 hours or overnight for the top surface to totally dry up before inverting and putting the filling. 6 To make the filling, mix all the ingredients together and pass through a strainer. Transfer to a stainless mixing bowl. 7 Set a 3 quart saucepan with 1/4 full of water and bring to a boil. Turn the heat down to simmer. 8 Put the mixing bowl with the cream custard on top of the simmering water (like cooking in a double boiler) and cook until thick or for 25 - 30 minutes, stirring continuously. 9 Cover the custard's surface with a cling wrap and refrigerate. 10 To assemble, dust the top with powdered or confectioner's sugar and invert the meringue in another pan with a parchment paper. 11 Spread the filling across the center of the meringue, and roll the meringue from one end towards the center(use the parchment paper to help in rolling), with the other end tucked under. 12 Trim off the ends and serve the Brazo de Mercedes whole or in slices. Again, I can't stress enough, make sure there are no traces of oil or egg yolk with the egg whites, as it will never peak and you will have to dump the whites and start over again. The Cream of Tartar is a stabilizer for the egg whites so it will hold its shape during mixing. Do not cook the filling in direct heat. If you have a double boiler, use it instead. If not, use a saucepan with simmering water and put the filling ingredients on a heat-proof bowl on top. This is one dessert that you will need to do one day to eat the next day. The meringue has to dry up before you can roll it, the filling has to be refrigerated and totally cooled down before spreading in the meringue. Before baking the meringue, you could lightly run a fork in zigzag on top to make it pretty and decorative. You could also flavor the cream custard with lemon extract : just add the zest of 1 lemon and 2 tablespoons lemon juice extract in the cream custard filling. I tried to double the condensed and evaporated milk in the recipe and added 1/4 cup sugar just so I will have a lot of the filling. It tasted great to have extra filling but the downside is that the filling is too heavy for the meringue that it drooped and can't hold it's shape.